Setup a professional greenhouse at any location with the GrowLab 80 Horticultural Grow Room. 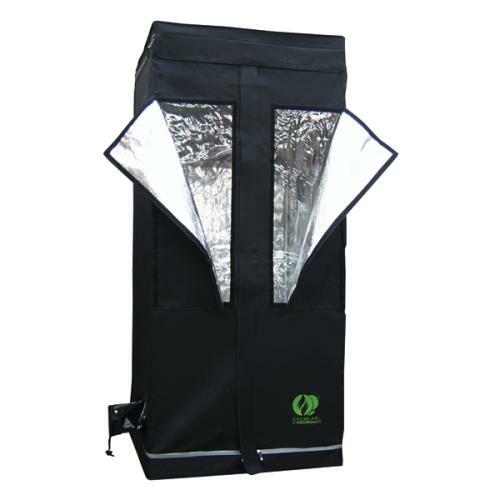 This portable Grow Lab provides you with all the amenities of a permanent greenhouse. The complete kit comes equip with non-toxic (will not react to heat and light) and thermally protected walls, a highly reflective interior, a waterproof floor, and a powder-coated framework that resists rust. You can also easily outfit your GrowLab with a ventilation fan and a lighting system because your equipment will easily snap onto movable roof cross-members (that support 100 lbs) and function using Adjust-A-Wingble fan and ducting attachments! No more clamps! However the best feature is the Clear Windows! It has everything you need and more for successful plant development! Get the brightest, slickest, most affordable grow room available at the best price of any discount gardening supply warehouse. Size: 2 '7" x 2' 7" x 5' 11".